Guide to installing, updating, and uninstalling OpenIDM software. This software offers flexible services for automating management of the identity life cycle. This guide shows you how to install OpenIDM services for identity management, provisioning, and compliance. Unless you are planning an evaluation or test installation, read the Release Notes before you get started. This guide is written for anyone installing OpenIDM software to manage identities, and to ensure compliance with identity management regulations. It covers the install and removal (uninstall) procedures that you theoretically perform only once per version. It aims to provide you with at least some idea of what happens behind the scenes when you perform the steps. You do not need a complete understanding of OpenIDM software to learn something from this guide, though a background in identity management and maintaining web application software can help. You do need some background in managing services on your operating systems and in your application servers. You can nevertheless get started with this guide, and then learn more as you go along. If you have a previous version of OpenIDM software installed, see "Compatibility" in the Release Notes before you install this version. This chapter covers the tasks required to prepare, install and start OpenIDM. ForgeRock documentation includes a separate Samples Guide. When you have read the first two chapters of this document, use the Samples Guide to test a number of different deployment scenarios. This section covers what you need to know before you install OpenIDM. For details of the supported Java Environment, see the "Java Environment" in the Release Notes. Locate your JRE Installation Directory. If you have not changed the installation path for the Java Runtime Environment during installation, it will be in a directory under C:\Program Files\Java\. Select Start > Control Panel > System and Security > System. Enter the Variable name (JAVA_HOME) and set the Variable value to the JRE installation directory, for example C:\Program Files\Java\jre7. OpenIDM runs in an OSGi container with an embedded Servlet container and an embedded noSQL database. By default the OSGi container is Apache Felix (Felix) and the default Servlet container is Jetty. No other configuration is supported. Follow the procedures in this section to install and run OpenIDM. To set up the server on a read-only volume, read "Installing on a Read-Only Volume". For a description of the Java requirements, see "Before You Install" in the Release Notes. Download OpenIDM from ForgeRock's BackStage site. By default, OpenIDM listens for HTTP and HTTPS connections on ports 8080 and 8443, respectively. To change the default port, edit your project's conf/boot/boot.properties file. For more information, see "Host and Port Information" in the Integrator's Guide. The hostname associated with OpenIDM by default is localhost. To change the default hostname, edit the openidm.host property in your conf/boot/boot.properties file. Before running OpenIDM in production, replace the default OrientDB repository, provided or evaluation, with a supported JDBC repository. For more information, see "Installing a Repository For Production". To run OpenIDM as a background process, see "Starting and Stopping the Server" in the Integrator's Guide. "Using OPENIDM_OPTS:   -Xmx1024m -Xms1024m -Dfile.encoding=UTF-8"
A default startup does not include certain configurable services, which will indicate an unsatisfied state until they are included in the configuration. As you work through the sample configurations described later in this guide, you will notice that these services are active. Startup errors and messages are logged to the console by default. You can also view these messages in the log files at /path/to/openidm/logs. Alternatively, you can manage the container and services from the Apache Felix Web Console. Select Main > Components to see core services and their respective states. You can stop OpenIDM from the -> prompt in the OSGi console, or through the Apache Felix Web Console. Both of these options stop the Felix container. In the Apache Felix Web Console, select Web Console > System Information to stop the container. On a 64-bit Windows server, you must have a 64-bit Java version installed to start the service. If a 32-bit Java version is installed, you will be able to install OpenIDM as a service, but starting the service will fail. Before you launch the install-service.bat file, which registers the service within the Windows registry, make sure that your JAVA_HOME environment variable points to a valid 64-bit version of the JRE or JDK. If you have already installed the service with the JAVA_HOME environment variable pointing to a 32-bit JRE or JDK, delete the service first, then reinstall the service. 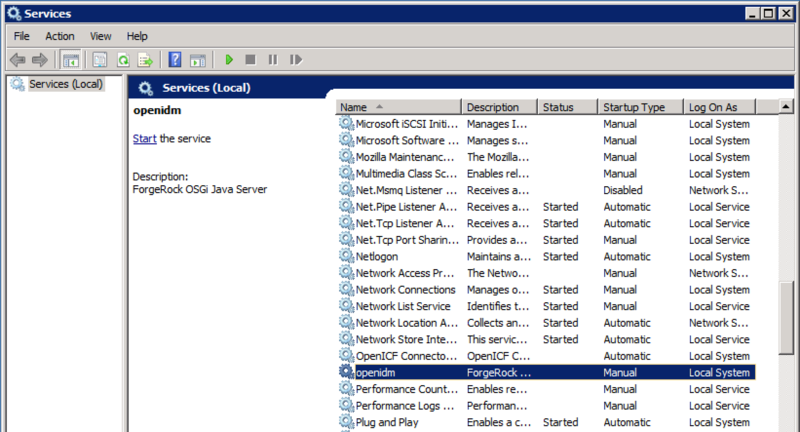 Use the Windows Service manager to manage the OpenIDM service. Change the user account for this service from the default (local system) account to an account with administrative privileges. The local system account has limited permissions and an OpenIDM service that runs with this account will encounter problems during synchronization. Double click the openidm service in the Windows Service manager. Select This Account and browse for an Active Directory administrative account. Enter the password for the administrative account. Use the Windows Service Manager to start, stop, or restart the service. OpenIDM provides RESTful access to users in its repository. To access the repository over REST, you can use a client application like Postman, or RESTClient for Firefox. Alternatively you can use the curl command-line utility that is included with most operating systems. For more information about curl, see https://github.com/bagder/curl. OpenIDM is accessible over the regular and secure HTTP ports of the Jetty Servlet container, 8080, and 8443. If you want to run curl over the secure port, 8443, you must either include the --insecure option, or follow the instructions in "Restrict REST Access to the HTTPS Port" in the Integrator's Guide. You can use those instructions with the self-signed certificate that is generated when OpenIDM starts, or with a *.crt file provided by a certificate authority. In numerous cases, curl commands to the secure port are depicted with a --cacert self-signed.crt option. Instructions for creating that self-signed.crt file are shown in "Restrict REST Access to the HTTPS Port" in the Integrator's Guide. Some of the examples in this documentation set use client-assigned IDs when creating resources, as it makes the examples easier to read. In general, immutable server-assigned UUIDs should be used in production. When you first install OpenIDM with an empty repository, no users exist. Create a user joe by sending a RESTful POST. The following curl commands create the user joe in the repository. Notice that more attributes are returned for user joe than the attributes you added in the previous step. The additional attributes are added by a script named onCreateUser.js that is triggered when a new user is created. For more information, see "Managed Object Configuration" in the Integrator's Guide. When you create a user some attributes might be required by the policy that is associated with that user. These are listed in the conf/policy.json file. By default, curl-based REST calls return the JSON object on one line. At least two options are available to clean up this output. Note that most command-line examples in this guide do not show this parameter, although the output is formatted for readability. You can manage OpenIDM using Web-based user interfaces, called the UI in this documentation set. OpenIDM includes UIs at two different endpoints, / and /admin. We refer to the administrative tools available at each endpoint as the Self-Service UI and the Administrative UI (Admin UI), respectively. The Self-Service UI allows regular (non-administrative) users to update parts of their profile, such as passwords and addresses. For more information, see "Configuring User Self-Service" in the Integrator's Guide. When these features are enabled, anonymous users can self-register and regular users can reset their own passwords. For more information, see "Working With the Self-Service UI" in the Integrator's Guide. In addition, administrative users can configure and manage workflows in the Self-Service UI. For more information, see "Managing User Access to Workflows" in the Integrator's Guide. In essence, the Self-Service UI supports day-to-day administrative tasks. In contrast, the Admin UI allows an administrator to define the server configuration. Administrators would access the Admin UI to learn about OpenIDM during initial system setup, and when they identify new requirements. The Admin UI also enables you to configure connections to external data stores, and to specify the reconciliation and synchronization configuration between data stores. When OpenIDM is running on the localhost system, you can access these UIs at https://localhost:8443/ and https://localhost:8443/admin, respectively. OpenIDM comes with an internal noSQL database, OrientDB, for use as the internal repository out of the box. This makes it easy to get started. OrientDB is not supported for production use, however, so use a supported JDBC database when moving to production. Type 'help' to display all the commands supported. This table is created on install and populated when there is any activity on the server. This table is created on install and populated when you run a reconciliation operation. You can also use OrientDB Studio to query the default OrientDB repository. After you have installed and started OpenIDM, point your browser to http://localhost:2480/. The default database is openidm and the default user and password are admin and admin. Click Connect to connect to the repository. You must restart OpenIDM for the change to take effect. This command updates both the repository and the repository configuration file. By default, OpenIDM uses OrientDB for its internal repository so that you do not have to install a database in order to evaluate OpenIDM. Before using OpenIDM in production, however, you must replace OrientDB with a supported JDBC repository. For details about the supported versions, see "Before You Install" in the Release Notes. This chapter describes how to set up OpenIDM to work with each of these supported repositories, and lists the minimum rights required for database installation and operation. For information about the general JDBC repository configuration, and how to map OpenIDM objects to JDBC database tables, see "Managing the Repository" in the Integrator's Guide. In general, OpenIDM requires minimal access rights to the JDBC repository for daily operation. This section lists the minimum permissions required, and suggests a strategy for restricting database access in an OpenIDM installation. The JDBC repository used by OpenIDM requires only one relevant user - the service account that is used to create the tables. Generally, the details of this account are configured in the repository connection file (datasource.jdbc-default.json). By default, the username and password for this account are openidm and openidm, regardless of the database type. All other users are created by the database-type/conf/openidm.sql script. The openidm user account must have SELECT, UPDATE, INSERT, and DELETE permissions on all the openidm tables that are created by this script, and by the scripts that create the tables specific to the Activiti workflow engine. The scripts that create the Activiti tables are new in OpenIDM 5.0.0. Prior to OpenIDM 5.0.0, these tables were created the first time OpenIDM was started. After you have installed MySQL on the local host and before starting OpenIDM for the first time, set up OpenIDM to use the new repository, as described in the following sections. OpenIDM is not running, not stopping. The table names are similar to those used with OrientDB. Run the three scripts that set up the tables required by the Activiti workflow engine. $ export OPENIDM_OPTS="-Xmx1024m -Xms1024m -Dopenidm.repo.host=localhost -Dopenidm.repo.port=3306"
These instructions are specific to MS SQL Server 2012 R2 Standard Edition, running on a Windows Server 2012 R2 system. Adapt the instructions for your environment. During the Feature Selection installation step, make sure that at least SQL Server Replication, Full Text Search, and Management Tools - Basic are selected. These instructions require SQL Management Studio so make sure that you include Management Tools in the installation. During the Database Engine Configuration step, select Mixed Mode (SQL Server authentication and Windows authentication). OpenIDM requires SQL Server authentication. Navigate to SQL Server Configuration Manager. Expand the SQL Server Network Configuration item and select "Protocols for MSSQLSERVER". Check that TCP/IP is Enabled. Select the IP Addresses tab and set the addresses and ports on which the server will listen. For this sample procedure, scroll down to IPAll and set TCP Dynamic Ports to 1433 (the default port for MS SQL). Restart MS SQL Server for the configuration changes to take effect. To restart the server, select SQL Server Services in the left pane, double click SQL Server (MSSQLSERVER) and click Restart. If you have a firewall enabled, ensure that the port you configured in the previous step is open for OpenIDM to access MS SQL. Navigate to SQL Server Management Studio. On the Connect to Server panel, select Windows Authentication and click Connect. Select File > Open > File and navigate to the OpenIDM data definition language script (path\to\openidm\db\mssql\scripts\openidm.sql). Click Open to open the file. Click Execute to run the script. This step creates an openidm database for use as the internal repository, and a user openidm with password openidm who has all the required privileges to update the database. 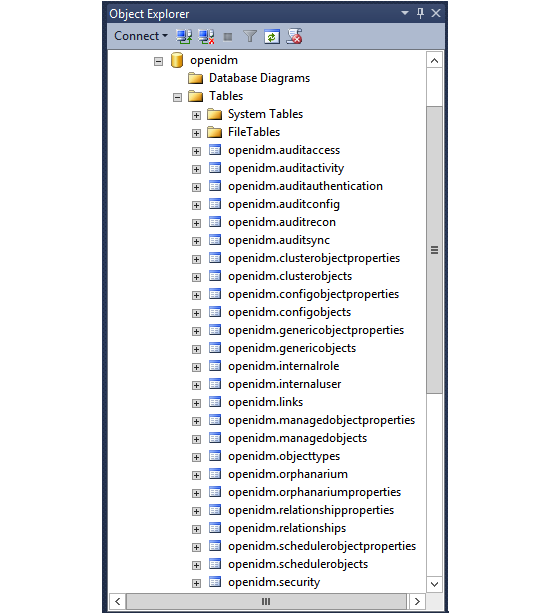 You might need to refresh the view in SQL Server Management Studio to see the openidm database in the Object Explorer. Expand Databases > openidm > Tables. You should see the OpenIDM tables in the openidm database, as shown in the following example. length of 1024 bytes. For some combination of large values, the insert/update operation will fail. It is very unlikely that the key length will be an issue in your deployment, and you can safely ignore this warning. Download the JDBC Driver 4.1 for SQL Server (sqljdbc_4.1.5605.100_enu.tar.gz) from Microsoft's download site. The precise URL might vary, depending on your location. Run the downloaded executable file; it should extract multiple files, include Java archive files, to a dedicated folder. Extract the executable Java archive file (sqljdbc41.jar) from the dedicated folder, using 7-zip or an equivalent file management application. Copy the Java archive file to openidm\db\mssql\scripts. Download the bnd Java archive file (bnd-1.50.0.jar) that enables you to create OSGi bundles. For more information about bnd, see http://bnd.bndtools.org/. Copy the file to openidm\db\mssql\scripts. This step creates a single .bar file, named sqljdbc41.bar. $ export OPENIDM_OPTS="-Xmx1024m -Xms1024m -Dopenidm.repo.host=localhost -Dopenidm.repo.port=1433"
When implementing an Oracle database for OpenIDM, confer with an Oracle DBA when creating the database schema, tables, and users. This section assumes that you have configured an Oracle Database with Local Naming Parameters (tnsnames.ora) and a service user for use by OpenIDM. Import the OpenIDM schema using the data definition language script (/path/to/openidm/db/oracle/scripts/openidm.sql), as the appropriate schema owner user. You can use the Oracle SQL Developer Data Modeler to run the scripts, as described in the corresponding Oracle documentation. Create a bind file and edit it to match the version information for your JDBC driver. $ export OPENIDM_OPTS="-Xmx1024m -Xms1024m -Dopenidm.repo.host=localhost -Dopenidm.repo.port=1525"
The jdbcUrl corresponds to the URL of the Oracle DB listener, including the service name, based on your configured Local Naming Parameters (tnsnames.ora). It should be whatever is appropriate for your environment. The DEFAULTCATALOG should match the user who "owns" the tables. If your schema owner is openidm, the DEFAULTCATALOG should also be openidm. This will cause OpenIDM to generate queries such as "SELECT objectid FROM openidm.internaluser". 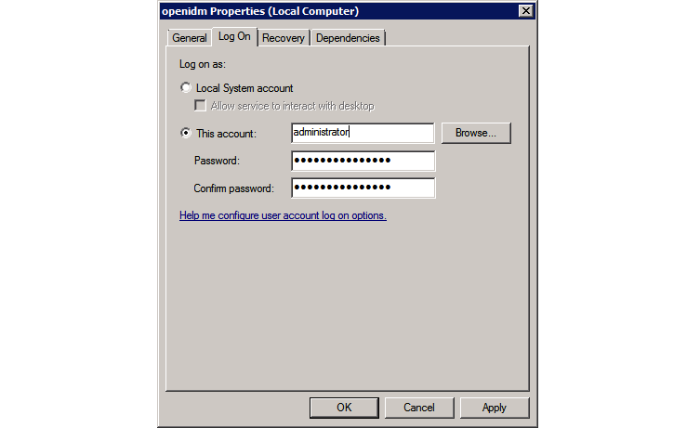 The username and password correspond to the credentials of the service user that connects from OpenIDM. When you have set up Oracle database for use as the OpenIDM internal repository, start OpenIDM to check that the setup has been successful. On startup, a number of INFO messages are output, as the predefined queries are processed. This procedure assumes that PostgreSQL is installed and running on the local host. For supported versions, see "Supported Repositories" in the Release Notes. OpenIDM includes a script (path/to/openidm/db/postgresql/scripts/createuser.pgsql) that sets up an openidm database and user, with a default password of openidm. The script also grants the appropriate permissions. Your database has now been initialized. If you changed the password in step 1 of this procedure, edit the datasource.jdbc-default.json file to set the value for the password field to whatever password you set for the openidm user. $ export OPENIDM_OPTS="-Xmx1024m -Xms1024m -Dopenidm.repo.host=localhost -Dopenidm.repo.port=5432"
PostgreSQL is now set up for use as the OpenIDM internal repository. If you are using the default project configuration, run the default_schema_optimization.pgsql script to create the required indexes. This script must be executed by a user with SUPERUSER privileges, so that the extension can be created. By default, this is the postgres user. This section makes the following assumptions about the DB2 environment. If these assumptions do not match your DB2 environment, adapt the subsequent instructions accordingly. DB2 is running on the localhost, and is listening on the default port (50000). The user db2inst1 is configured as the DB2 instance owner, and has the password Passw0rd1. This section assumes that you will use basic username/password authentication. For instructions on configuring Kerberos authentication with a DB2 repository, see "Configuring OpenIDM for Kerberos Authentication With a DB2 Repository". Before you start, make sure that OpenIDM is stopped. Set up OpenIDM to use the DB2 repository, as described in the following steps. Download the DB2 JDBC driver for your database version from the IBM download site and place it in the openidm/db/db2/scripts directory. Use either the db2jcc.jar or db2jcc4.jar, depending on your DB2 version. For more information, see the DB2 JDBC Driver Versions. You can use the sample bind file located in openidm/db/mssql/scripts. Copy the bind file to the same location as the JDBC driver. The JDBC driver version information for your driver is located in the Specification-Version property in the MANIFEST file of the driver. Edit the bind file to match the JDBC driver version. Place the bnd Java archive file in the same directory as the JDBC driver, and the bind file. Change to the directory in which the script files are located and run the following command to create the OSGi bundle. A new .bar file has now been created. Move the .bar file to the openidm/bundle directory and rename it with a .jar extension. The actual name of the file is unimportant. $ export OPENIDM_OPTS="-Xmx1024m -Xms1024m -Dopenidm.repo.host=localhost -Dopenidm.repo.port=50000"
Create a user database for OpenIDM (dopenidm). Import the data definition language script for OpenIDM into your DB2 instance. The database schema is defined in the SOPENIDM database. When you have set up DB2 for use as the OpenIDM internal repository, start OpenIDM to check that the setup has been successful. After startup, you should see that repo.jdbc is active, whereas repo.orientdb is unsatisfied. By default, OpenIDM uses the username and password configured in the repository connection configuration file (conf/datasource.jdbc-default.json) to connect to the DB2 repository. You can configure OpenIDM to use Kerberos authentication instead. In this scenario, OpenIDM acts as a client and requests a Kerberos ticket for a service, which is DB2, through the JDBC driver. This section assumes that you have configured DB2 for Kerberos authentication. If that is not the case, follow the instructions in the corresponding DB2 documentation before you read this section. 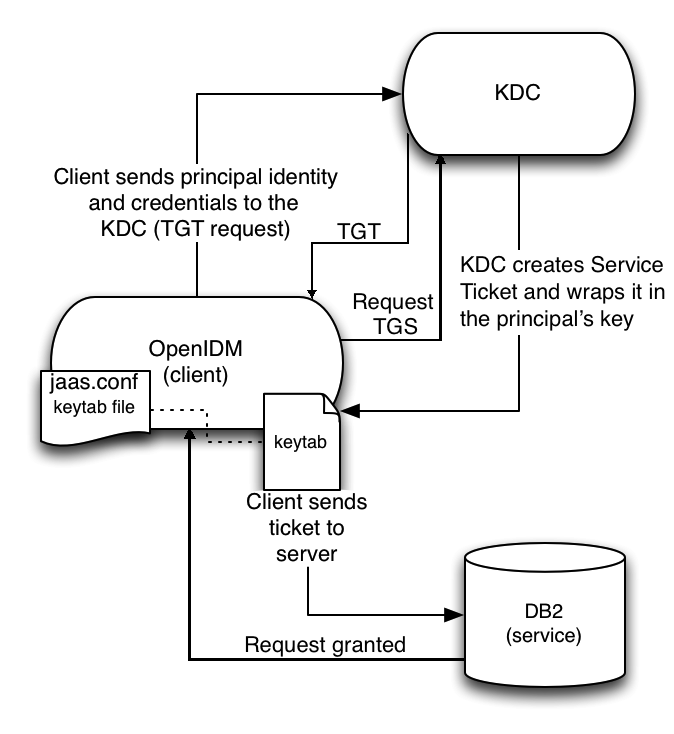 The following diagram shows how the ticket is obtained and how the keytab is referenced from OpenIDM's jaas.conf file. Create a keytab file, specifically for use by OpenIDM. A Kerberos keytab file (krb5.keytab) is an encrypted copy of the host's key. The keytab enables DB2 to validate the Kerberos ticket that it receives from OpenIDM. You must create a keytab file on the host that OpenIDM runs on. The keytab file must be secured in the same way that you would secure any password file. Specifically, only the user running OpenIDM should have read and write access to this file. Make sure that the DB2 user has read access to the keytab. Edit your project's conf/system.properties file, to add the required Java options for Kerberos authentication. This chapter covers uninstallation and describes how to move an existing installation to a different location. (Optional) Stop the service if it is running, as described in "To Stop OpenIDM". (Optional) If you use a JDBC database for the internal repository, you can drop the openidm database. Shut down the server, as described in "To Stop OpenIDM". This chapter describes the process to update an existing deployment to OpenIDM 5. The update process is largely dependent on your deployment and on the extent to which you have customized OpenIDM. Engage ForgeRock Professional Services for help in updating an existing deployment. If you are updating from OpenIDM 4 and above on UNIX/Linux systems, you can take advantage of new OpenIDM update options from the command-line and the Admin UI. For a generic view of the update process, see "An Overview of the Update Process". You cannot update directly from OpenIDM 4.0 to OpenIDM 5. To update from OpenIDM 4.0, first update to OpenIDM 4.5, as described in Updating From OpenIDM 4.0 to OpenIDM 4.5 in the OpenIDM 4.5 Installation Guide. Then update from OpenIDM 4.5 to OpenIDM 5, as described in "Updating to OpenIDM 5". To migrate a deployment from OpenIDM 3.1.0 to OpenIDM 4.0, see Migrating From OpenIDM 3.1 to OpenIDM 4.0 in the OpenIDM 4 Installation Guide. To migrate a deployment from OpenIDM 3.0.0 to 3.1.0, see Migrating to OpenIDM 3.1.0 in the OpenIDM 3.1.0 Installation Guide. To migrate a deployment from OpenIDM 2.1.0 to 3.0.0, see Migrating to OpenIDM 3.0.0 in the OpenIDM 3.0.0 Installation Guide. To migrate a Windows deployment from OpenIDM 4.0 to 4.5, see Migrating From OpenIDM 4.0 to OpenIDM 4.5 on Windows in the OpenIDM 4.5 Installation Guide. To migrate a Windows deployment from OpenIDM 4.5 to OpenIDM 5, see "Migrating to OpenIDM 5 on Windows". Redirect client traffic to a different OpenIDM system or cluster. Shut down every node in the cluster. Clone the first node to the other OpenIDM instances in that cluster. The update process does not support changes to any project directory when configured as a subdirectory of /path/to/openidm. That includes the samples listed in the /path/to/openidm/samples directory. For more information on the samples, see "Overview of the Samples" in the Samples Guide. OpenIDM documentation represents the project directory as project-dir. It is an OpenIDM best practice to copy the default project or sample to an external installation project-dir directory, such as /path/to/project. If needed, this is an opportunity to move the project-dir to such a location, to facilitate the OpenIDM update process. Apart from the repository update scripts, the update process does not change information related to data and schema. The update process also generally does not change scripts in your project directories. For a list of files affected during the update process, see "Files Changed During the Update Process". Update is supported only with the supported JDBC repositories, and not with the default OrientDB repository. As such, repository update scripts are provided only for the supported JDBC repositories. For instructions on installing a supported repository, see "Installing a Repository For Production". If you customized configuration files for your deployment of OpenIDM 4.5, such as JSON files, or files related to a custom UI, you'll need to reapply what you customized after the update is complete. For more information, see "Managing Custom Changes After an Update". This section provides background information on the update process. If you want to jump to the steps required to update from OpenIDM 4.5 to OpenIDM 5, read "Updating to OpenIDM 5". "The Update Process in Labels"
"Files Changed During the Update Process"
When you start an update, OpenIDM goes through a process to determine the files to be updated, to facilitate repository updates, to move OpenIDM into maintenance mode before implementing an update, and then to restart OpenIDM after the update is complete. Most of these steps happen automatically when you run the update from the UI or CLI. The following basic steps include labels that you might see in log files, if there are problems. PREVIEW_ARCHIVE: Preview the archive using appropriate checksums, to define the files to be updated. ACCEPT_LICENSE: Present the appropriate license for the update. If the license is not accepted, the update stops, and you retain all files in your current OpenIDM installation. LIST_REPO_UPDATES: Identify and save scripts to update the current repository. PAUSING_SCHEDULER: Pause the scheduler, to prevent new jobs from starting during the update process. WAIT_FOR_JOBS_TO_COMPLETE: Wait for any currently running jobs to complete. ENTER_MAINTENANCE_MODE: Set OpenIDM in maintenance mode, which disables non-essential OpenIDM services. INSTALL_ARCHIVE: Install the update archive into OpenIDM. WAIT_FOR_INSTALL_DONE: Wait until the installation of the update archive is complete. MARK_REPO_UPDATES_COMPLETE: Note status when repository updates are complete. EXIT_MAINTENANCE_MODE: Exit from maintenance mode. ENABLE_SCHEDULER: Enable the scheduler. OpenIDM will re-establish any schedules that were previously in place. FORCE_RESTART Restart OpenIDM to implement all changes that require it. OpenIDM 4 and above includes MD5 checksums for each file. When updating, these checksums allow OpenIDM to verify file changes. The checksum of the file as originally installed. The checksum of any file included in the update or patch. Because of the nature of Java archives in the openidm/bundle directory, OpenIDM updates all files in that directory, even if they have not changed. New files are written to the target directory. Existing files are saved with a .old-unix_time extension. If the original file was customized, it is saved with a .old-unix_time extension. The update process writes access.js files with a .new-unix_time extension in the same directory. You must merge any changes from the latest version of the .new file into your customized script file. For more information, see "Managing Custom Changes After an Update". Project configuration files (JSON): Files related to your project are patched with the content of the corresponding version 5 configuration file, regardless of whether they have been customized. If you have customized standard OpenIDM JSON configuration files, be careful. Analyze the OpenIDM 5 version of that file. It may include new features that you want. As a best practice, apply each customization to the corresponding version 5 file and test the change before you put it into production. For more information, see "Managing Custom Changes After an Update". System configuration files: (boot.properties, system.properties, config.properties, logging.properties, and jetty.xml) are written with a .-new-unix_time extension in the same directory, regardless of whether they have been customized. You must merge any changes from the latest version of the .new file into your existing configuration file. For more information, see "Managing Custom Changes After an Update". Project configuration files (JSON): Files related to your project are overwritten with the content of the corresponding version 5 configuration file, regardless of whether they have been customized. If you have customized any standard OpenIDM JSON configuration files, be careful. Analyze the version 5 file. It may include new features that you want. As a best practice, apply and test each custom change to the version 5 configuration file. For more information, see "Managing Custom Changes After an Update". System configuration files: (boot.properties, system.properties, config.properties, logging.properties, and jetty.xml) are not patched if they have been customized. Instead, the update process creates configuration files with a .new-unix_time extension in the same directory. You must merge any changes from these .new- files into your customized configuration files. For more information, see "Managing Custom Changes After an Update". If you have not customized these files, the update process replaces the existing configuration file with the corresponding version 5 file. Existing files are overwritten and no backup files are created. OpenIDM configuration information is stored in your supported repository. The update process overwrites information in that data store. The unix_time is the number of seconds since the Unix Epoch of January 1, 1970. For a list of checksums, review the openidm/.checksums.csv file. It contains a list of checksums for every original file in your openidm/ directory. You need to copy update archives, in zip format, to the openidm/bin/update directory. OpenIDM creates that directory during the start process. If you've changed defaults in the boot.properties file, be careful, as this can affect the OpenIDM boot process; refer to Update boot.properties for details. If you want to try your own update, make sure that the origin and destination version numbers match your current and planned update versions of OpenIDM. The version numbers may be either specific, such as 5.0.0 or a range, such as [5.0.0.1,5.0.0.3). That range supports version numbers 5.0.0.1 and 5.0.0.2 (but not 5.0.0.3). For a full explanation of how you can specify a range of versions, see "Setting the Connector Reference Properties" in the Integrator's Guide. If you want to delete files during the update process, include them in the removeFile code block. To preserve existing keystore and truststore files, update.json includes the default versions of these files in the filesToBeIgnored code block. If you want to keep the update process from overwriting other files, add them to the same code block. On UNIX/Linux systems, you can update OpenIDM 4.5 to OpenIDM 5 by using the cli.sh update command. For general information on cli.sh and cli.bat, see "Command-Line Interface" in the Integrator's Guide. Allows you to specify the server user and password. Specifying a username is mandatory. If you do not specify a username, the following error is shown in the OSGi console: Remote operation failed: Unauthorized. If you do not specify a password, you are prompted for one. This option is used by all three subcommands. The URL of the REST service. The default URL is http://localhost:8080/openidm/. This can be used to import configuration files from a remote running instance. This option is used by all three subcommands. The port number associated with the REST service. If specified, this option overrides any port number specified with the --url option. The default port is 8080. This option is used by all three subcommands. Automatically accept the license shown in /path/to/openidm/legal-notices/Forgerock_License.txt. If you omit this option, the update process prompts you to accept or decline the license. Bypasses a preview of repository updates. Suitable if you have already downloaded and approved changes to your repository. The maximum time, in milliseconds, that the command should wait for scheduled jobs to finish before proceeding with the update. The maximum time, in milliseconds, that the server should wait for the update process to complete. Use quiet mode to minimize messages at the console; messages are still available in the log file defined by --log. If you use --quiet mode for updates, include the --acceptLicense option. Waiting for running jobs to finish. All running jobs have finished. UNEXPECTED Existing file is not in the list of known files for the original distribution. NONEXISTENT A file in the new installation that does not exist in the original distribution. This is always the status for versioned files, such as the openidm-*.jar files in the openidm/bundle/ directory. DELETED The file should exist in the current installation but does not; The file is installed during the update. DIFFERS The file, located in a read-only directory, has changed, since the original deployment. UNCHANGED The file is not changed from the original distribution. REPLACED Original file replaced; if the original file was changed by a user, it is saved with a .old extension. PRESERVED Original file saved with changes made by a user. New file saved with a .new extension. APPLIED The update changed the file. REMOVED The update removed the file. "Managing Custom Changes After an Update". Download OpenIDM (IDM-5.0.0.zip) from ForgeRock's BackStage site. Before starting the update process, back up your existing deployment by archiving the openidm directory, as well as the contents of your repository. As there is no "undo" option available during the update process, this backup can be used to restore your deployment or restart the update process if something goes wrong. Save any customized *.json configuration files, typically located in your project's conf/ subdirectory. You'll need to make judgements on how to apply these customizations to your OpenIDM 5 deployment after the update is complete. Identify files in custom directories. Save them, and apply them to your updated deployment after all stages of the update process are complete. For more information, see "Managing Custom Changes After an Update". If your project directory is located on a read-only volume, mount that directory in read-write mode before starting the update process. If you have integrated OpenIDM with OpenAM, first disable the authentication module you used (OPENID_CONNECT, OAUTH, or OPENAM_SESSION), as described in "Disabling and Re-enabling Connections to OpenAM". You can re-enable this module when the update is complete. OpenIDM 5 is not compatible with the 4.5 version of the boot.properties file. If you start the update process with version 4.5 of this file, the update will fail on restart. The boot.properties file must include the options available with version 5 of the file. New defaults are shown in bold. # enables the statistics MBean for BoneCP. Enabling this will have a performance impact on BoneCP. If you have customized the default conf/boot/boot.properties file in your OpenIDM 4.5 instance, rename that file to something like conf/boot/boot.properties.bak. Copy the default conf/boot/boot.properties file from the version 5 delivery to your 4.5 conf/boot directory. If you have not customized the default 4.5 conf/boot/boot.properties file, you can overwrite it with version 5 of this file. Compare the 4.5 file (conf/boot/boot.properties.bak) with the version 5 boot.properties file and copy any customized properties from the 4.5 file to the new version 5 file. The openidm.instance.type property was used to propagate a keystore to different nodes in a cluster. That responsibility is now up to you. For more information, see "Clustering, Failover, and Availability" in the Integrator's Guide. After your changes to boot.properties are complete, the update process will add a boot.properties.new-unix-time file to your project's conf/boot/ subdirectory. OpenIDM 5 includes a number of scripts that you must run to update your repository schema. The update process detects which scripts are required for your repository, extracts them from the OpenIDM 5 binary, and prompts you to save them in a directory relative to the 4.5 installation directory. The scripts must be run at different stages during the update process. The following section describes which scripts you must run at which time. You might need to get Database Administrator (DBA) help and approval to run these update scripts. OpenIDM must be running when you launch an update (using the UI or the CLI). If you use anything but the standard Admin and Self-Service UIs, the update process may affect you in different ways; see "Files Changed During the Update Process". If you followed the procedure described in "Customizing the UI" in the Integrator's Guide, you'll have custom files in the openidm/ui/admin/extension and openidm/ui/selfservice/extension directories. OpenIDM 5 includes significant UI improvements. The update process does not copy those improvements to the noted extension/ subdirectories. When you're ready to run the update process, "Updating to OpenIDM 5". If you've followed the procedure in the OpenIDM 4.5 Full Stack Sample - Using OpenIDM in the ForgeRock Identity Platform, you've set up a ForgeRock Identity Provider. Select Configure > System Preferences. In the default OpenIDM 4.5 Authentication tab, edit the OpenAM Session module and set Module Enabled to false. You should now be able to log into OpenIDM normally, without authenticating through OpenAM. You can now proceed with the update process described in this chapter. If you need integration with OpenAM, we recommend that you also upgrade to AM 5. For more information, see the OpenAM Upgrade Guide. 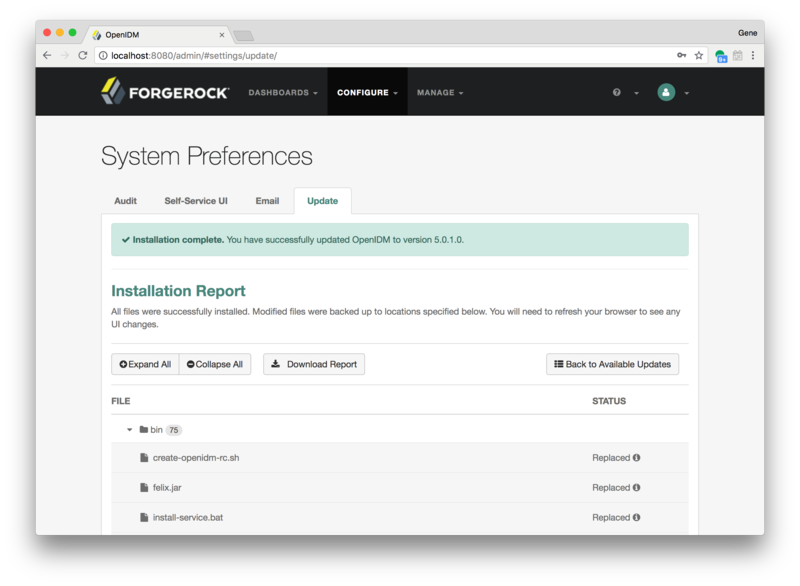 You can then configure integration with OpenAM based on the scenario described in "Integrating OpenIDM With the ForgeRock Identity Platform" in the Samples Guide. When you have completed the steps in "Preparing for Updates", your OpenIDM 4.5 instance is ready for an update to version 5. Copy the new update binary, IDM-5.0.0.zip, to the /path/to/openidm/bin/update directory. OpenIDM creates that directory the first time you start OpenIDM 4.5. Now you can start the update process, using the CLI or the Admin UI. This section includes separate procedures for those options. These warnings have no effect on the successful completion of the update and can be safely ignored. If you are using a port other than 8080, specify the port number. Include --port number in the ./cli.sh update command. Enter a directory name, for example, update-scripts. The update process creates this directory, relative to your OpenIDM 4.5 installation directory, and saves the required scripts to that directory. Repository scripts are in the following directory: update-scripts. Please come back and run the update again with --skipRepoUpdatePreview after updates have been reviewed. For MySQL, MSSQL, and DB2, apply the v3_add_audit_access_response_detail.sql script. For Oracle Database, apply the v3_add_fk_relationships.sql and v4_add_audit_access_response_detail.sql scripts, in numeric order. For PostgreSQL, apply the v5_add_audit_access_response_detail.sql script. Run repository update scripts now, and then enter 'yes' to complete the OpenIDM update process. At this point you can apply the remaining repository update scripts. These scripts are numbered differently for the different repositories, but are essentially the same scripts: v*_drop_security_table.sql and v*_modify_indices_for_audit.sql. When you have applied the scripts, type yes in the terminal where you launched the update, to continue the update process. The update completes and restarts the server. If you are using the Admin UI, you must refresh your browser after the update is complete. Log into the Admin UI at http://localhost:8080/admin. Select Configure > System Preferences, and choose the Update tab. You should see IDM-5.0.0.zip in the list of Available Updates. Click Install to start the process, then Confirm and Install to enable Maintenance Mode. The instructions in the UI are intuitive. During the update, an Installation Preview screen will show you a list of the files that will be affected by the update, in the categories described in "Preview of File Updates". You'll be asked to confirm the Update and accept the license agreement. The Repository Update Script Preview shows the scripts that you must run to update your repository. The scripts must be run at specific times during the update process, so follow these steps exactly. When you have applied the first script/scripts, click Continue. Update paused. Process all repository updates manually before resuming. When you have applied the scripts, click Mark Complete to continue the update process. For updates from OpenIDM 4.5 to OpenIDM 5, the update process appears to "get stuck" just before completion. This issue has been fixed in version 5, and should not appear when you update from OpenIDM 5 to a later version. When the update is complete, refresh the browser. Scroll to the bottom of the Admin UI. You should see the updated version number in the footer of the web page. You can also see the updated version by navigating to Configure > System Preferences > Update. Refresh your browser after this update is complete. Regardless of the method you have used to run the update, you will have additional work to do before putting your system back into production. For customizations to the server, start with files that include .new-unix_time extensions. For more information, see "Managing Custom Changes After an Update". If you've customized OpenIDM 4.5, you may find files with the following extensions: .old and .new. For more information, see "An Overview of the Update Process". $ find . -type f -name "*.old*"
$ find . -type f -name "*.new*"
Files with the .old-unix_time extension are saved from the configuration you had when starting this update process. Files with the .new-unix_time extension are files from OpenIDM 5 that have not been incorporated into your updated installation. For example, if you find a system.properties.new-unix_time file in your project-dir directory, OpenIDM is still using your pre-update version of this file, which would still be named system.properties. To take full advantage of OpenIDM 5, analyze the new features shown in files with the .new-unix_time extension. If you have files with multiple .new-unix_time extensions, use the file with the latest unix_time. Pay particular attention to your connector configuration files (provisioner.openicf-connector-name.json). The update removes outdated connector versions so you must make sure that the bundleVersion in your connector configuration matches the version of the connector in /path/to/openidm/connectors, or specifies a range that includes the connector version, for example [1.1.0.0,1.4.0.0]. For more information, see "Setting the Connector Reference Properties" in the Integrator's Guide. The update process does not account for any changes that you made to existing standard JSON files such as sync.json and managed.json. In fact, the update process overwrites these files with the standard OpenIDM 5 versions of those files. Do not overwrite the new version 5 files. Instead, analyze the custom settings from your original JSON files. Review "What's New" in the Release Notes. Apply each custom setting to the files in your updated deployment and test the results to make sure they still work as intended. If you've followed the recommendations in "Configuring the Server for Production" in the Integrator's Guide, changes you've written directly to JSON files may not be loaded into the repository. This includes JSON files that may have been removed per the removeFile code block in "The update.json File". Write changes directly to the repository, using an HTTP PATCH request. Temporarily change production settings that may block configuration updates from JSON files, such as those described in "Disabling Automatic Configuration Updates" in the Integrator's Guide. If you have a custom Admin UI or Self-Service UI, you need to take a few extra steps. You will need the updated UI files from the openidm/ui/admin/default and openidm/ui/selfservice/default directories. So you'll have to delete some files first. Delete the existing openidm/ui/admin/extension and openidm/ui/selfservice/extension subdirectories. Review your UI custom files. Compare them against the OpenIDM 5 version of these files. Apply your custom changes to each new OpenIDM 5 UI file in the openidm/ui/admin/extension and openidm/ui/selfservice/extension subdirectories. The steps outlined in this section will help you take advantage of the new functionality offered in this version, while preserving your custom configuration where possible. Before you start, read through "Compatibility" in the Release Notes. Some of these changes might affect your existing deployment. Updates to OpenIDM 5 on Microsoft Windows remain a manual process. Download and extract the OpenIDM 5 (IDM-5.0.0.zip). Backup: Save your current deployment. Archive the openidm directory. The HTTP, HTTPS, and mutual authentication ports are specified in the conf\boot\boot.properties file. If you changed the default ports in your OpenIDM 4.5 deployment, make sure that the corresponding ports are specified in this file. Check that the keystore and truststore passwords match the current passwords for the keystore and truststore of your OpenIDM 4.5 deployment. Depending on the level of customization you have made in your current deployment, it might be simpler to start with your OpenIDM 5 boot.properties file, and copy all new settings from that file to the version associated with OpenIDM 5. However, as a best practice, you should keep all configuration customizations (including new properties and changed settings) in a single location. You can then copy and paste these changes as appropriate. Security files: Copy the contents of your OpenIDM 4.5 security\ folder to the OpenIDM 5 instance. Examine the following excerpt from the boot.properties file. The locations of the keystore.jceks and truststore files with the installation directory. Check that your customizations work as expected, then port the changes to the new script in the openidm-5\script directory. Alternatively, copy the connector .jar files from your existing installation into the openidm\connectors\ folder of the new installation. Complete the OpenIDM 5 installation, as described in "Preparing to Install and Run Servers". Start with the default 4.5 configuration. For each configuration file that you have customized, use a file comparison tool such as the Windows fc.exe utility to assess the differences between your customized file and the OpenIDM 5 file. Based on the results of the fc.exe review, either use your existing file as a base and port the OpenIDM 5 changes to that file, or vice versa. Ultimately, you want to preserve your customizations but ensure that you are up to date with the latest default configuration. All files should end up in the openidm-5/conf directory. If you are using the UI, clear your browser cache after the migration. The browser cache contains files from the previous release, that might not be refreshed when you log in to the new UI. Test that your existing clients and scripts are working as intended. You can only run an update to OpenIDM 5.0.1.1 from versions 5.0.0, 5.0.0.1, 5.0.0.2, 5.0.0.3 and 5.0.1.0. If you are on a version prior to 5.0.0, you must first update to 5.0.0. For more information, see "Updating to OpenIDM 5". You can run the update process in one of two ways: using the command-line interface script cli.sh or the Admin UI. Download OpenIDM (openidm-5.0.1.1.zip) from ForgeRock's BackStage site. Back up your 5.0.0 deployment. Save any customized *.json configuration files, located in a /path/to/openidm/conf subdirectory. Save your custom directories. If you have a read-only deployment, mount the directory in read-write mode before starting the update. If you integrated OpenIDM with OpenAM, disable the authentication modules that you enabled for the integration. If you have a custom conf/boot/boot.properties file, rename the file to something like conf/boot/boot.properties.bak. Extract openidm-5.0.1.1.zip to a temporary directory. Copy the custom conf/boot/boot.properties file to your 5.0.1.1 conf/boot directory if you have customized the boot/boot.properties file. If you have not customized the default 5.0.0 conf/boot/boot.properties file, you can simply overwrite it with version 5.0.1.1 of this file. Start OpenIDM. OpenIDM must be running when you launch an update using the Admin UI or the CLI. Disable and re-enable connections to OpenAM. See "Disabling and Re-enabling Connections to OpenAM" for more information. The update steps using the CLI (cli.sh) are the same as the steps in "Updating From the CLI", except for the zip file. License was accepted via command line argument. If the script discovers a database repository update file, it will ask you to specify a directory to save the file. Enter a directory and then press return. The update will continue then stop and ask you to run the cli.sh command again. The update process continues and completes with a PENDING_REPO_UPDATES status. Enter yes to complete the process. Repository update preview was skipped. Run repository update scripts now, and then enter 'yes' to complete the IDM update process. No longer in maintenance mode. Your update has successfully completed. Select Configure > System Preferences, and choose the Update tab. You should see openidm-5.0.1.1.zip in the list of Available Updates. Click Install to start the process, then click Confirm and Install to enable Maintenance Mode. Next, review the Installation Preview screen. The screen shows a list of the files that will be affected by the update in the categories described in "Preview of File Updates". After reviewing the files, click Install Update to continue. Review the License Agreement, and if you agree, click Accept Licence Agreement. At this point, you should see an Installing Update page. Near the end of the update process, review the Repository Updates screen. The Repository Updates screen shows the script that you must apply to update your repository. For MySQL, MSSQL, and DB2, apply the v6_add_primary_key_to_properties_tables.sql script. For Oracle databases: use v7_add_primary_key_to_properties_tables.sql. For PostgreSQL databases: use v9_add_primary_key_to_properties_tables.sql. OpenIDM 5.0.1.1 has an existing bug with the Download button when downloading the v6_add_primary_key_to_properties_tables.sql file (for MySQL, MSSQL, or DB2 databases), which results in a file with an undefined value. If you have a MySQL, MSSQL, or DB2 database, manually copy the v6_add_primary_key_to_properties_tables.sql file from /path/to/openidm/db/repo_type/scripts/updates to the openidm/update-scripts directory, then apply the script as shown in the next step. Apply the script depending on your repository. When you have applied the scripts, click Mark Complete. When the update completes, refresh your browser. You should see an Installation Complete message that indicates that you have successfully updated OpenIDM to version 5.0.1.1. The page also displays an installation report of all the files that were modified and backed up to specific locations. The Maintenance Service disables non-essential services of a running OpenIDM instance, in preparation for an update to a later version. When maintenance mode is enabled, services such as recon, sync, scheduling, and workflow are disabled. The complete list of disabled services is output to the log file. Before you enable maintenance mode, you should temporarily suspend all scheduled tasks. For more information, see "Pausing Scheduled Jobs" in the Integrator's Guide. You can enable and disable maintenance mode over the REST interface. If the server is in maintenance mode, the command returns "maintenanceEnabled": true, otherwise it returns "maintenanceEnabled": false. Some enterprises choose to enhance security of their applications by installing them on a dedicated read-only (ro) filesystem volume. This appendix describes how you can set up OpenIDM on such a volume. This appendix assumes that you have prepared the read-only volume appropriate for your Linux/UNIX installation environment. Before you continue, read "Preparing to Install and Run Servers", as well as the prerequisites described in "Before You Install" in the Release Notes. This appendix assumes that you have set up a regular Linux user named idm and a dedicated volume for the /idm directory. When you run the mount -a command, the /dev/volume volume device gets mounted on the /idm directory. In this section, you will modify appropriate configuration files to redirect data to writable volumes. This procedure assumes that you have a user idm with Linux administrative (superuser) privileges. Create an external directory where OpenIDM can send logging, auditing, and internal repository information. You can also route audit data to a remote data store. For an example of how to send audit data to a MySQL repository, see "Audit Samples" in the Samples Guide. If you use the unsupported OrientDB repository, you should also set up a writable directory to substitute for project-dir/db/openidm. Open the audit configuration file for your project, project-dir/conf/audit.json. Make sure handlerForQueries is set to repo. Open the logging configuration file for your project: project-dir/conf/logging.properties. Open the configuration properties file for your project: project-dir/conf/config.properties. Connectors. Depending on the connector, and the read-only volume, you may need to configure connectors to direct output to writable volumes. In a production environment, you must configure a supported repository, as described in "Installing a Repository For Production". You should address one more detail, the value of the OPENIDM_PID_FILE in the startup.sh and shutdown.sh scripts. If you have set up a different command line shell, adjust your changes accordingly. When you log in again as user idm, your OPENIDM_PID_FILE variable should redirect the process identifier file, openidm.pid to the /var/run/openidm directory, ready for access by the shutdown.sh script. You need to set up security keystore and truststore files, either by importing a signed certificate or by generating a self-signed certificate. For more information, see "Securing & Hardening Servers" in the Integrator's Guide. The first startup of OpenIDM either processes the signed certificate that you added, or generates a self-signed certificate. You can now mount the /idm directory in read-only mode. The configuration in /etc/fstab ensures that Linux mounts the /idm directory in read-only mode the next time that system is booted. You can now start OpenIDM, configured on a secure read-only volume. JSON Web Token. As noted in the JSON Web Token draft IETF Memo, "JSON Web Token (JWT) is a compact URL-safe means of representing claims to be transferred between two parties." For OpenIDM, the JWT is associated with the JWT_SESSION authentication module. An object that represents the identity-related data managed by OpenIDM. Managed objects are configurable, JSON-based data structures that OpenIDM stores in its pluggable repository. The default configuration of a managed object is that of a user, but you can define any kind of managed object, for example, groups or roles. A module system and service platform for the Java programming language that implements a complete and dynamic component model. For a good introduction, see the OSGi site. While OpenIDM services are designed to run in any OSGi container, currently only Apache Felix is supported. OpenIDM includes two different types of provisioning roles and authorization roles. For more information, see "Working With Managed Roles" in the Integrator's Guide. In the context of reconciliation, a source object is a data object on the source system, that OpenIDM scans before attempting to find a corresponding object on the target system. Depending on the defined mapping, OpenIDM then adjusts the object on the target system (target object). A pluggable representation of an object on an external system. For example, a user entry that is stored in an external LDAP directory is represented as a system object in OpenIDM for the period during which OpenIDM requires access to that entry.System objects follow the same RESTful resource-based design principles as managed objects. In the context of reconciliation, a target object is a data object on the target system, that OpenIDM scans after locating its corresponding object on the source system. Depending on the defined mapping, OpenIDM then adjusts the target object to match the corresponding source object.